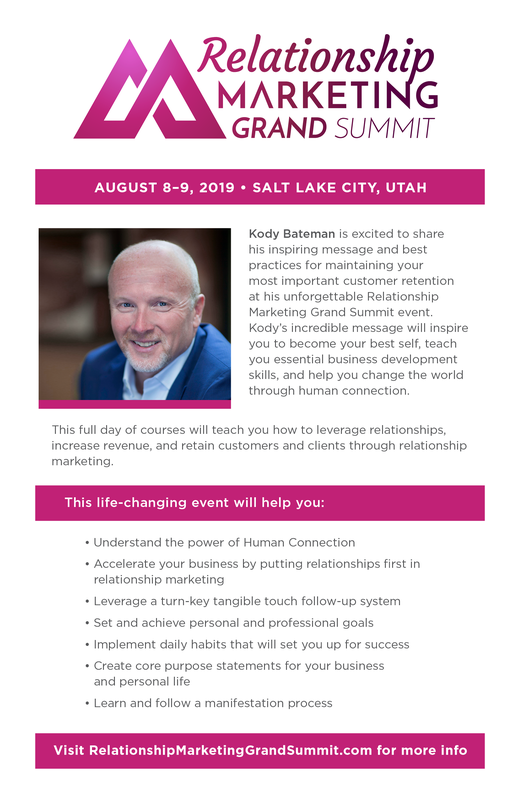 SendOutCards Co-founder and CVO, Kody Bateman, has announced the speaker lineup for the Relationship Marketing GRAND Summit! Join him and for this incredible program created to help businesses learn how focusing on relationship marketing can enhance your client retention. Register now and plan get ready for two days of education in Salt Lake City, UT, this summer, August 8-9, 2019. Click here for the official announcement and speaker bios. Download this informational flyer to inform others about this extraordinary summit, where you will learn business-building techniques that focus on the power of human connection and how that can facilitate business growth. If you are a SendOutCards Affiliate you also have access to a special event invitation card, found within the SendOut Community Card Collection, in the Card Catalog. Send out this event card to let others know the importance of attending this event.